If you like Harley Quinn and hula girls then this Harley Quinn bobble hula figurine is what you just need to have. 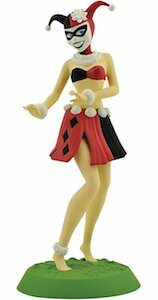 The figurine is 8-inch tall and shows Harley Quinn dressed in a bikini top and hula skirt that are in her typical red and black colors and even have some diamond shapes on them. And Harley Quinn will move her body when you shake it and that makes this a bobble figurine. You know people that have a hula girl in their car, maybe you can put Harley Quinn and then she will shake her body while you drive. The Harley Quinn figurine comes in a nice display box so you can even keep her in the box while you can admire her. If you want a Princess Leia figurine then this is what you want and it’s more interactive to as it is a Princess Leia bobblehead. The Star Wars figure is made my Funko in their wobbler series. Princess Leia is 4.5 inches tall and comes with a black stand that has her name on it and Leia herself is wearing her famous white dress and is holding her weapon just in case. 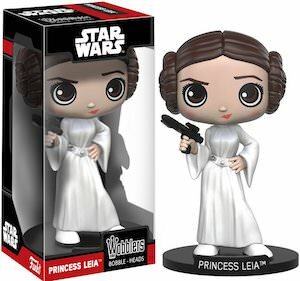 And this Leia bobblehead looks a bit more cartoon style making it even more fun. Just put the bobblehead on your desk and she will be shaking her head at you all day long. He’s not gone. He’s here and is going to become a a bobbling fixture in your collectibles collection. It’s Jase Robertson, one of the brother stars of A&E’s Duck Dynasty. Jase Robertson one of the brothers of the Duck Dynasty family and this bobblehead features a great likeness to this duck call inventing machine. He is wearing his usual camouflage outfit, beanie and sunglasses on his head. Don’t forget that Robertson beard, isn’t it amazing?!? This Jase bobblehead measures approximately 7 inches tall and is made of high-density resin. If you are a serious fan of Duck Commander and Duck Dynasty, you are going to love this bobblehead. Get quacking with the Duck Dynasty Jase Robertson Bobblehead. 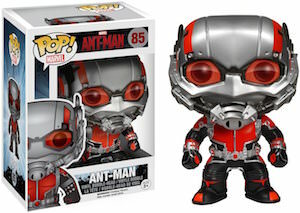 Ant-Man maybe the smallest superhero out there and now you can own a big version of the famous Ant-Man. This Pop! Vinyl figurine is not just a figure it’s also a bobblehead so that it can shake it’s head at you all day long. The Ant-Man figurine is 3 3/4 inch tall and that of course is much bigger then the real Ant-Man. It would be great to have this Marvel superstar in your collection and if you like him to stay as new then you can keep it in it’s nice display box. Come take a better look at this Marvel Ant-Man Bobblehead Figurine. “That’s it! I’ve had it with this dump. We got no food. We got no jobs. Our pets’ head are falling off!” Oh Lloyd, life is tough, but what does Harry have to say about it? “You know Lloyd, just when I think you couldn’t possibly be any dumber, you go and do something like this and totally redeem yourself!” What a pair! Created by Funko, the pair are dressed in their blue and orange tuxedo’s that they wore to the Aspen Snow Owl benefit. 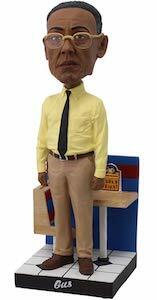 Each of the characters say 5 different quotes and stand 6″ tall. The talking is initiated by a simple bobble of the head. 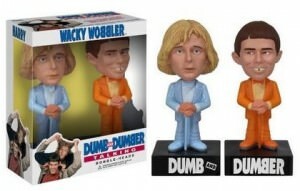 Add to your collection today this Dumb and Dumber Talking Bobblehead Set. Now you can have your own Rocket Raccoon that shakes his head at you all day long. This 3 3/4 inch tall bobblehead is made by Funko in the Pop! vinyl range. This Guardians of the Galaxy figurine has all the details you expect from Rocket and he would be a great addition to your figurine collection. And Rocket Raccoon comes in a display style box that gives you the option to leave it nicely in the box so that it stays in new state. 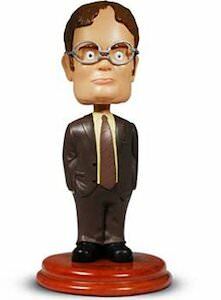 With a little bobblehead like this you have a great character to for on your desk or book shelve. 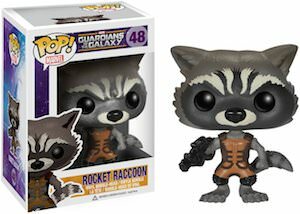 Come take a better look at this Marvel Guardians of the Galaxy Rocket Raccoon Bobblehead. There is Star-Lord in all his glory and without the mask. And no this is not just a pop! Vinyl figurine, this is one that is also a bobblehead. The Guardians of the Galaxy figurine is 3 3/4 inch tall and looks a lot like the real Star-Lord does in the movie and yes he brought some weapons to. 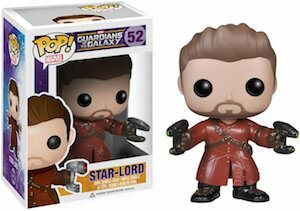 You can keep Star-Lord in his display box or get him out and shake him so that you can really enjoy him shaking his head. And this Star-Lord figurine fits right into you collection of Pop Vinyl figurines as he is the same size just with and extra feature. Come and take a closer look at this Marvel Guardians of the Galaxy Star-Lord Bobblehead.